First of all, yes it’s been a very long time since I’ve posted. Sorry. But recently I’ve felt the conviction to begin writing again. I’ve had several people encourage me along these lines. So I figured the easiest way to get started would be to take the lazy route and post something that I’ve already done earlier this year. John 9 – Blind. Faith. Last Friday I had surgery for the first time. This year after numerous tests and doctor’s visits they discovered that I had non-acid reflux going on. While this doesn’t sound as serious as acid reflux, it still has its own set of risks, some of which can be serious including aspirating fluid which can cause repeated bouts of bronchitis and possibly pneumonia, problems eating and difficulty sleeping. So, several months ago I consulted with a surgeon and decided to move forward with a procedure called the “LINX”. The concept is fairly simple. I reflux because my lower esophageal sphincter (LES) is weak and doesn’t close properly, therefore allowing stomach contents to reflux all the way back into my larynx. 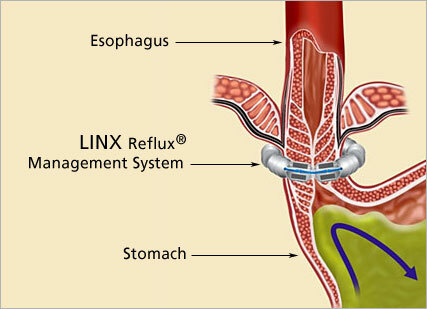 The LINX device is a ring of interlocked magnetic titanium beads that tighten my LES and prevent reflux, but expand as I swallow to allow food and liquid to pass into the stomach. It’s done laparoscopically, takes about an hour and is outpatient. It’s also completely reversible if it ever needs to be removed. I was a little anxious about having the procedure done. I was a little unnerved about being 36 years old and living the rest of my life with a metal implant. To me the thought just made me feel so…old. Then I remembered my son. I’ve honestly lost count as to the number of surgeries he’s had. I know it’s over ten. In addition, he doesn’t just have a small metal ring implant, but two large titanium rods in his back that he must have extended surgically ever 6 months. For me, this surgery was hopefully a one-time deal. For him, it’s part of his life. As I went into the operating room I remembered my brave little seven-year-old, and part of me is thankful that I get to share in a small way with what he deals with regularly. I now have some scars just like him that I can show him. What Will My Disabled Son Be When He Grows Up? I was deeply moved and humbled; he wants to be like me. I don’t know what all of that means in his mind. I’m not sure to which aspects of my life he aspires, but somewhere in there he sees that I’m a daddy, and that looks pretty fun to him. Barring a miracle, Isaiah will never have biological children of his own. Aside from the difficulties for him of mentally being able to have a wife and family, it’s just not physically possible. As he answered my question tonight a wave of both love and sadness flooded over me in an instant. A father can receive no higher compliment from his son than to hear him say “I want to be like you when I grow up.” But I was also impacted by the sad fact that he cannot have children. In the earthly sense, he cannot be a daddy. I wrestled with that question some tonight. What will my son be when he grows up? Most likely he’ll be living with us for the rest of our lives. Perhaps as he grows into an adult he’ll be able to become more independent in some things, but what’s in store for him? We honestly don’t see college on the horizon. I’m not trying to sound pessimistic about his abilities, but I’m just facing the fact. Isaiah will never be a doctor, a lawyer, an engineer, etc. Those are not his callings in life. 1. Professional Happiness Generator – Isaiah makes people smile. He makes them laugh. The boy is hilarious and he has no clue that he is. He’s just himself and with that can brighten a room. His joy is contagious and his high fives inspiring. Isaiah makes people happy. 2. 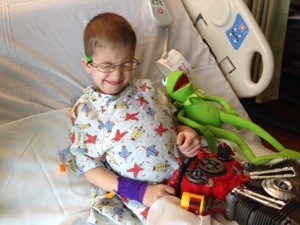 A Missionary – As I wrote in a previous post, Isaiah often has his iPad with him when he’s in the hospital playing his sermons. Last week after surgery on Monday we ended up back in the hospital for two more days when his bowels slowed down and he started vomiting. He recovered just fine, but this gave us two more days share the gospel with people via Isaiah’s iPad pulpit. One doctor heard about the Trinity, a nurse heard the gospel clearly presented, and a sister in Christ was encouraged. 3. A Spiritual Daddy – I truly believe that if there are not people that have come to Christ through his life already, that there will be by the time his journey on earth is done. He may not mentor or disciple others, pastor a church or write books, but God is using him and will continue to use Isaiah for his glory and to carry out his purposes. I believe Isaiah will have “spiritual” offspring, those brought into the kingdom by God’s Holy Spirit working through our little guy. I can’t wait to find out how the Lord was using him when I get to heaven. I actually see Isaiah working in all of these jobs right now. He doesn’t get paid. He doesn’t take a vacation. And he even works on sick days. My son’s worth and value in the sight of God does not now nor will it ever depend on him having a wife and kids, a well-paying job, a college education, etc. He was created as a person in a magnificent and wonderful way with a distinct purpose in this life – to serve the Lord. Thank you to everyone who has been praying for Isaiah’s surgery. Isaiah is doing fine. I just got a text message from my wife that they are closing him up now and he should be out in the next 20 minutes or so. Things got off a little hectic this morning. The plan had been for Cristy to take Isaiah in for his surgery while I stayed with are little girl Nadia. The departure time was supposed to be 4:30AM. So about 4:15 I wake up to notice that no lights are on. I woke Cristy, and I must say I’ve never seen her move that fast in my life =). Isaiah will spend one night in the hospital for observation and should hopefully be home tomorrow. I’ll be updating here later as the day goes on. 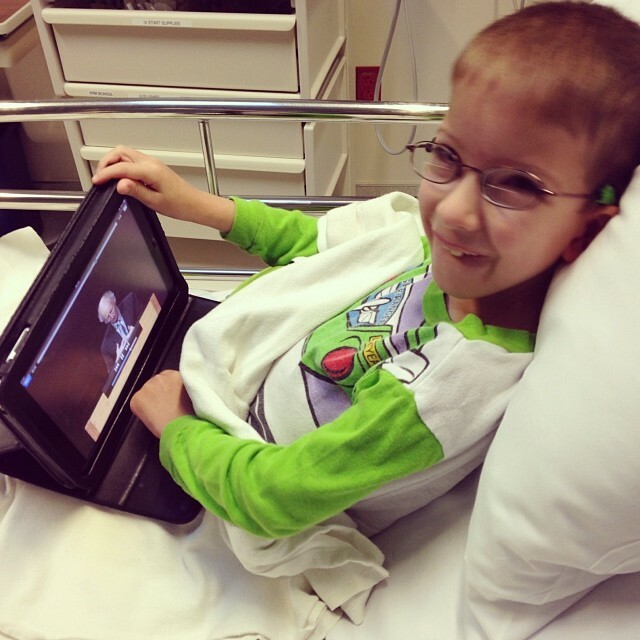 Isaiah watching his sermons before surgery. We hope to be home tomorrow. Thanks for all the prayers and please continue that he’ll heal up with no complications, and also that he’d stay well. Tomorrow is Isaiah’s surgery. Friday I came down sick. Bad combination. If you’ve had surgery before, or if a loved one has had surgery you know that one is not supposed to be sick prior. It is for this reason that we usually try to semi-quarantine Isaiah the week before surgery, keeping him away from nose-pickers, and little humans who cough without covering their mouths and eat food off of the floor. On top of this, on a scale of 1-10 of people who are hyper-vigilant about germs, I’m at least a 13. So of course I get sick Friday. Blah. A year ago my orthodoxy had me convinced that I shouldn’t confess the weakness of my heart when it comes to trusting the Lord in these kinds of situations. I know that we’re not supposed to doubt God, that everything God does is perfect and right, without a doubt. So therefore I pretended like the groanings of my heart weren’t really there and forced a smile. But I’m a sinner…saved, but still a sinner, and why should I seek to hide the things that God knows are there already? Don’t misunderstand me, I’m not saying it’s right to doubt God, or that it’s right to be frustrated with what he’s ordained. I’m simply being honest. In my weakness, I doubt, fear, and question. “How can this be right?” I ask. “How is it that me getting sick now is the best thing for our family and brings the most glory to God?” It doesn’t seem right to me. Certainly, this is not the way I would have planned it, and that is evident by the copious amounts of hand sanitizer I have used these past two weeks. It is evident in the fact that I got the flu shot the first day it was available. It is evident in the amount of vitamin C I’ve taken, elderberry extract and echinacea I’ve swallowed and zinc lozenges I’ve sucked on. My plans were to stay healthy. God’s were not. So I’m sick; hacking, coughing, wheezing, sneezing, etc. I’ve taken every precaution and I’m still sick, and now that I’m sick I’m taking every caution to not get Isaiah sick by keeping my distance, covering my face with a rag when I cough and washing my hands like a pharisee. I take necessary precautions, because I believe the Lord gives us common sense to be careful and wise in such situations, but ultimately I should not trust in these things. I all too often trust in my horses, in the strength of my earthly precautions and powers. I’m tempted to think and say “I’ve got this.” But the Lord says to me, “No, I’ve got this.” No amount of herbal extract can ward of the sovereign hand of the Lord. His ways are right, though mysterious, and far beyond my understanding. Yes, there is a part of me that fears right now, but there is also the confidence that God is doing something here that I cannot see, even if it’s merely to yank me off of my chariot and cause me to rest in him. Just a short post to say how humbled our family has been by the response to yesterday’s post. Many thanks to Tim Challies for sharing the story on his blog. Our prayer above all else is that the Lord would be glorified and that we would be instruments for his praise. Isaiah is a gift from God, and his life has opened up more doors for the gospel than we could ever imagine. Thank you to all of you who are praying. I will be posting an update here on Monday after his surgery and during his time in the hospital.